Motorists are advised to watch for deer crossing roadways throughout the year, but especially in the late fall at dawn and dusk. Deer are very active at that time of year because the mating season, or rut, is underway and bucks and does have their minds on other things than traffic! Be especially cautious when driving at dawn and dusk, when deer are most active. Remember, deer are creatures of habit. If you have seen deer crossing the road in a certain location, slow down and use caution when driving in that area. If you see one deer on the road, keep a sharp eye out for others. If you see a doe, stay alert - her fawns or a rutting buck may be following close behind. 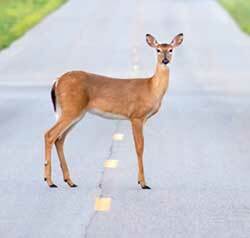 In a typical year, an estimated 1,200 deer/vehicle collisions occur in New Hampshire. 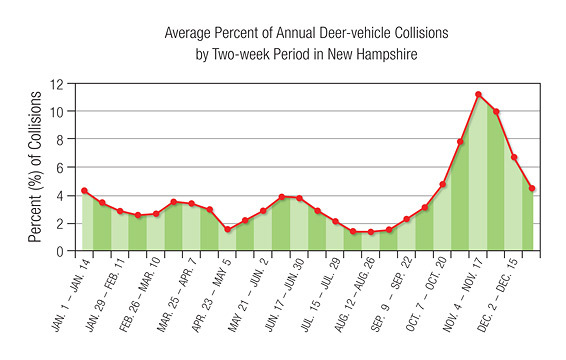 As the chart below indicates, almost a third of all deer-vehicle collisions in New Hampshire occur from mid-October through the end of November.